The OED told the BBC that it was beyond the software engineer's control to determine how the word should be said. The difference of opinion coincided with Mr Wilhite being awarded a lifetime achievement prize at The Webby Awards. 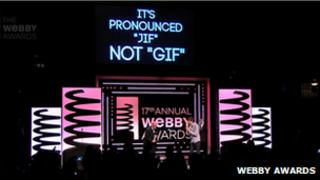 To mark the moment, screens at the ceremony displayed a message he had written saying: "It's pronounced 'Jif'". The retired US-based software writer developed the Graphics Interchange Format in 1987 while working at the internet service provider Compuserve. Although the Jpeg format later caught on because it is better at compressing photographs, Gif's technique remains superior at tackling images containing large areas of uniform colour when no more than 256 different colours are used in the whole picture. Gif's enduring popularity has also been helped by the fact it supports animations, making it easy for people to embed short clips into blogs, and copy and paste jokey looping video - such as odd actions by the actor James Van Der Beek - into discussion forums. The format's long-lasting appeal was underlined by Google's recent announcement that it was adding a feature to help users search for such files, saying Gifs had "become the de facto standard for short animations on the web, from pony glitter text to grumpy cat memes". The Gif Pronunciation Page has long catalogued evidence that Gif sounds like Jif. The site suggests the reason for this was to make it sound like a popular brand of American peanut butter - "one of the principal three programmer foods (the other two being Pepsi and nacho cheese Doritos)". That reference would be lost on UK users, who are more likely to associate Jif with lemon juice or an abandoned brand of sink cleaner. The Oxford English Dictionary's chief editor John Simpson made it clear that whatever the word's roots, the fact many people used the hard "g" meant that option was acceptable. "The pronunciation with a hard 'g' is now very widespread and readily understood," he said. "A coiner effectively loses control of a word once it's out there; for instance, the coiner of quark in the physics sense had intended it to rhyme with cork, but general usage has resulted in it rhyming with mark. "Whichever pronunciation you use for Gif, it should of course be the same for both the noun and the verb." The American Heritage Dictionary also states the acronym can be said both ways. The White House has also weighed in on the debate when it made it clear, last month, that President Obama preferred to use the "hard g". News of Mr Wilhite's intervention sparked a flood of responses from other web users. "Preach it, Gif inventor," tweeted @xaxnermaclaren. "Finally, the Gif has been liberated! Yes!" added @themightythor. "Unless we are going to pronounce graphics as jraphics he makes zero sense," posted Scathe to Reddit. "I will never pronounce it that way sir! Never!" wrote @CharlesTrippy. Next you're going to tell me it's pronounced 'gaypeg'," added TheObviousChild. Creative Review magazine took a more balanced stance, saying only: "Well, there you jo."